NEW YORK CITY - Circa October, 2017 - A daytime overcast establishing shot of traffic on the Brooklyn Bridge on the Brooklyn side. Lower Manhattan and the Freedom Tower is in the distance. NEW YORK - Circa July, 2016 - A daytime establishing shot of the new Freedom Tower in Manhattan. NEW YORK - Circa July, 2016 - A daytime establishing shot of the new Freedom Tower as seen from Church Street in the financial district in lower Manhattan. NEW YORK - Circa August, 2016 - A daytime establishing shot of the Freedom Tower in Lower Manhattan. NEW YORK CITY - Circa October, 2017 - A daytime overcast establishing shot of an NYU campus building in lower Manhattan. NEW YORK CITY - Circa October, 2017 - A foggy time lapse view of the top of the Freedom Tower in lower Manhattan. 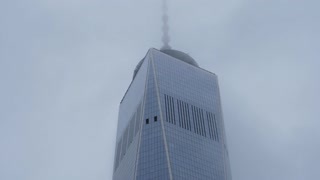 NEW YORK CITY - Circa October, 2017 - A foggy realtime view of the top of the Freedom Tower in lower Manhattan. 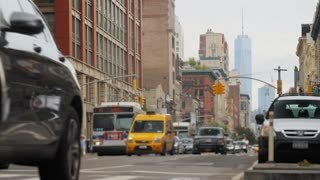 A low angle daytime overcast establishing shot of midtown Manhattan traffic. The New York City skyline and Freedom Tower is in the distance. NEW YORK CITY - Circa October, 2017 - A daytime rainy establishing shot of typical traffic in lower Manhattan. A high angle daytime establishing shot (DX) of the apartment buildings in lower Manhattan's Two Bridges neighborhood. The financial district skyline and Freedom Tower in the distance. NEW YORK CITY - Circa October, 2017 - A daytime overcast establishing shot of traffic on the Brooklyn Bridge. Tourists and runners can be seen on the pedestrian walkway. A high angle daytime establishing shot (DX) of the buildings and storefronts in lower Manhattan's Two Bridges neighborhood. The financial district skyline and Freedom Tower in the distance. 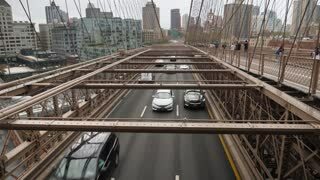 NEW YORK CITY - Circa June, 2018 - A daytime slow zoom push in to the Lower Manhattan skyline with the Freedom Tower seen above the Brooklyn Bridge.